Where do ideas come from? This is often heard at calligraphic gatherings where work is on display. 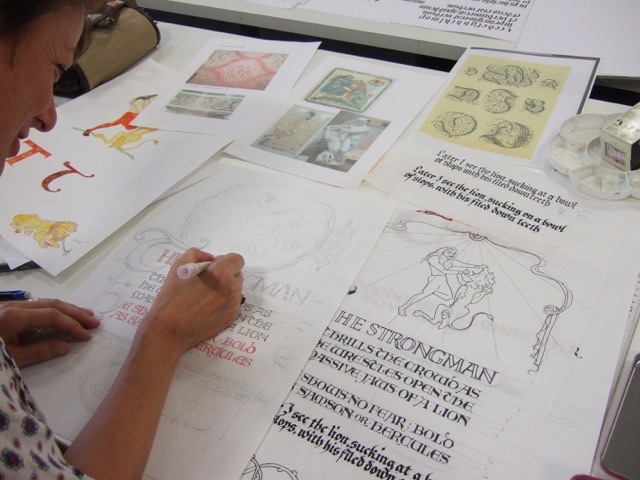 The SSI’s two linked Study Days aim to help participants to find inspiration for calligraphic pieces and then to work with them to develop these initial ideas into more substantial work. Led by an SSI Fellow, the first day is based on a visit to a museum collection where there is a wealth of artefacts to spark ideas. Group discussion following the visit will help with how to begin to work with what has inspired you. The second day is a practical workshop where you can work on developing your initial explorations with feedback from the leader and discussion with your peer group. Your work, both roughs and any finished pieces, will be exhibited at a subsequent Skills & Ideas day, where you will have the opportunity to talk about the process. The next Study Days will take place in 2020; details will be announced later in 2019. They are open to both SSI members and non-members. Previous Study Days have been led by Cherrell Avery FSSI and Ann Hechle FSSI. Participation in both days is essential.